Martyn Hilbert's Railway Photography - Branch Lines - 33107 on the Weymouth Harbour Tramway. 33107 on the Weymouth Harbour Tramway. 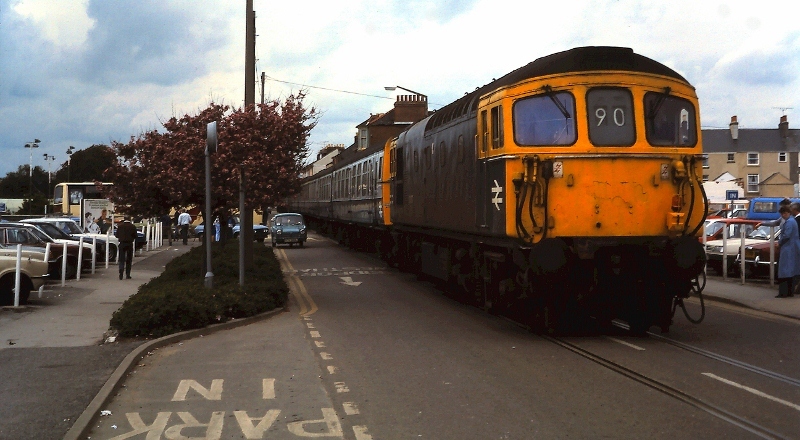 The Reliant Regal 3-Wheeler sticks close to the kerb, as 33107 runs slowly down the middle of Commercial Road, flanked by car parks, with a Channel Islands Boat Train from London Waterloo on the 30th May 1986. Such civilised methods of going on holiday have now ceased, the last train to use the tramway was in 1999. There was always something fascinating about this line - the sight of a main line train in the middle of a main road with any stray traffic keeping well out of the way!